ESP is an open-source software platform that organizes and maps electronic health record data, analyzes the data for conditions of public health interest, and can transmit either case reports or aggregate summaries to health departments. ESP also serves as the platform for a distributed data network that can be queried by authorized public health officials to assess conditions of interest in aggregate, in a secure and transparent fashion under the oversight and control of the data owner. ESP uses algorithms to detect infectious diseases, chronic conditions, and other issues of public health interest. ESP can create and submit electronic case reports for notifiable diseases that clinicians and clinical practices are required by law to report to health departments. ESP can improve the safety of vaccine programs by detecting and reporting adverse vaccine events to the national Vaccine Adverse Event Reporting System (VAERS). ESP allows for custom querying and creation of population level summary reports. ESP includes algorithms to identify patients at risk for key diseases, such as HIV and cardiovascular disease. RiskScape is ESP's web-based data visualization system. 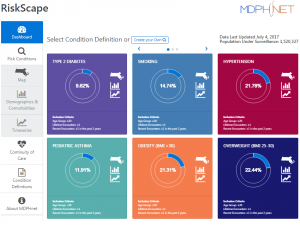 RiskScape allows users to map diseases or health conditions, explore affected populations, and assess for changes over time in an easy and intuitive fashion. ESP source code and technical resources are available from this site free of charge. ESP is open source and free to use under a BSD-3-Clause license. Consult the Implementation Kit to walk through the steps required to start using ESP. The ESP/MDPHnet Coordinating Center is part of the Therapeutics Research and Infectious Disease Epidemiology group (TIDE) in the Department of Population Medicine at Harvard Medical School and Harvard Pilgrim Health Care Institute.